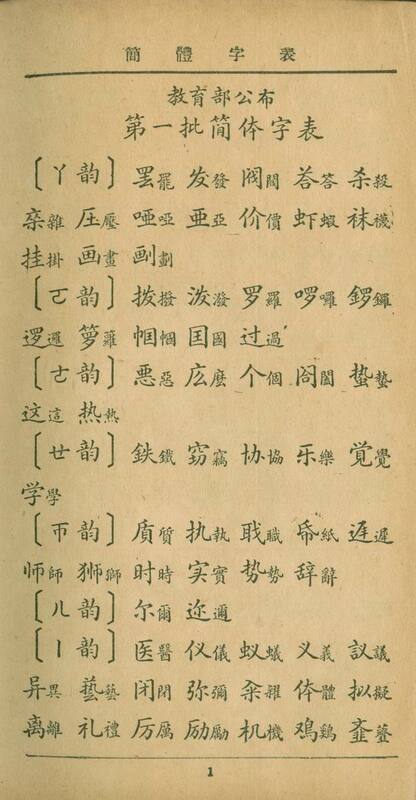 The image below shows part of the list of simplified Chinese characters introduced by the Republic of China Department of Education in 1935. They were retracted in 1936, so China continued to use traditional characters until the People's Republic of China made simplified characters official in the 1950s. What are the official reasons for the retraction? Side note for those unfamiliar with Chinese characters: It is interesting to note that many of the simplifications introduced by the Republic of China (ROC) are similar to those eventually introduced by the People's Republic of China (PRC), because many of the simplifications have already existed as variant characters. Relative to the current simplified characters in use, the ROC simplifications appear to be more conservative both in stroke reduction, and in the number of characters being simplified (about 300 characters). An English language report in The Quarterly Bulletin of Chinese Bibliography states that, on October 4, 1935, the government “authorized” the use of simplified characters in official and private documents. In other words, the government granted permission for the use of simplified characters, but did not insist that they be used. This passive attitude toward script reform was not sufficiently powerful to undermine the edifice of well-established tradition it faced. Thus in January of 1936 the simplified character scheme was withdrawn before it could be truly applied. This withdrawal is typically attributed to the intervention of Dai Jitao, an influential conservative in the government who used his connections in the Ministry of Education to have the scheme rescinded. Whether or not the withdrawal can be traced back to a specific individual, conservative opposition was certainly the major factor in its failure. Not the answer you're looking for? Browse other questions tagged china language writing taiwan or ask your own question.